We heard that an update for the Verizon Galaxy Nexus was coming "soon", but the news didn't say exactly what update we were going to see. Now we know, and it's good news everyone. It looks like the Verizon Galaxy Nexus is about to get Android 4.2.2, as the update has rolled out to testers. The word comes from the good folks over at XDA, where member El Madhattersays that he got the test build of Android 4.2.2 for his Verizon GNex this week. 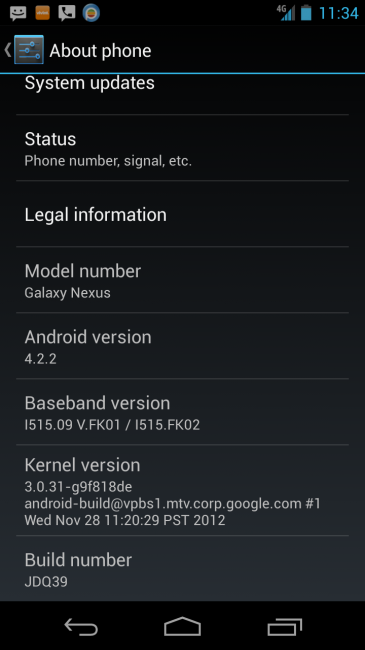 The update is build JDQ39, and comes with new radio baseband versions listed as FK01 and FK02. So far, other testers have commented on the XDA forum thread saying that the new radios work "really well".